Brittany Ham's series About Ritual observes the way that social media has impacted the ritual of daily life, and examines the way that digital media has affected traditional modes of art making. In an increasingly connected world, daily activities that were once private and mundane are now public. Rituals of the leisurely body are carefully posed and arranged to appear cool and effortless on the digital screen. Places like concerts, camp grounds, beaches and the home have become backdrops for staging. Once private rituals of the bedroom are open for viewing, and the presence of social media can be felt in the way that we celebrate, live, and grieve. Now more than ever people are afforded the opportunity to curate the way their lives are perceived. The work mimics the look of digitally rendered media, and examines the relationship between traditional and contemporary modes of working. Brush strokes that imply the mark of computer generated imagery coexist with the expressive marks of traditional painting practice. The flatness of a digital mark may hover above the texture of a hand rendered stroke, and the rough color pencil drawing found in many of the images serves as experiential link between the two. In the same way that the structure of daily life has been affected by social media, so too have historical modes of art making. Contemporary practice has become a chimera of sorts; a mishmash of traditional techniques that have evolved to keep up with contemporary innovations. 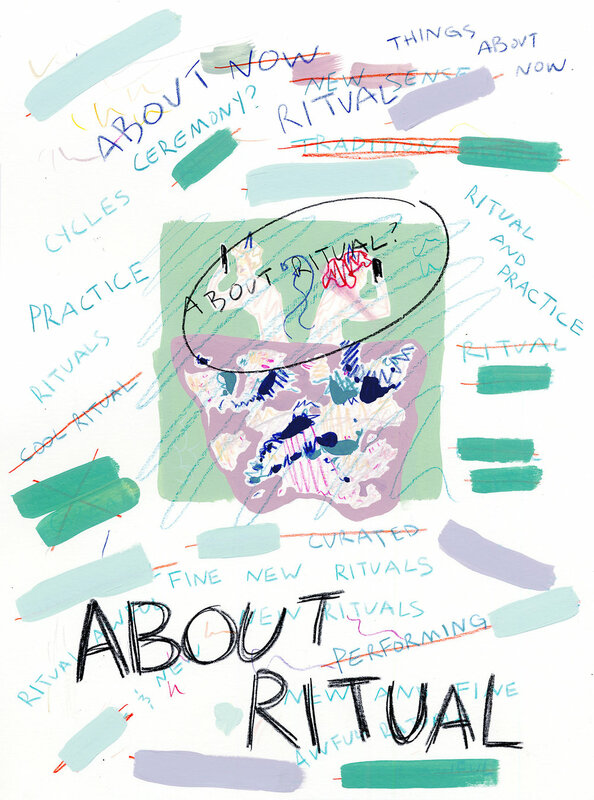 About Ritual observes the absurdity found in staging the body for a life well presented, and explores the parallels found in the adaptations made by the body and traditional art practice in response to social and digital media. In a world curated for the screen, life and art have evolved to keep up.